All of us are constantly exposed to all kinds of stimuli from our environment which affect how we feel and how we think about ourselves and about the world. An example of how we are affected is our mindset. Some events, remarks, and expectations that come our way evoke a fixed mindset in us while others evoke a growth mindset. The prime example of this is the differential effect of different types of praise. Praise about our traits or about the type of person we are evoke a fixed mindset in us. This type of praise makes it more likely that we start to view our abilities as fixed, that we become more afraid of challenges, etc. Process oriented praise evoke a growth mindset in us. These compliments strengthen our belief in the malleability of our abilities and they make it more likely that we will challenge ourselves. A new study exposes a different factor which influences our mindset. Burkley et al. (2016) did a study which showed that mindsets are socially contagious. Participants in the study were divided over three conditions. All participants read a story about a successful person. The article of group 1 mentioned that this person said he had always been good at what had made him successful. The article of group 2 mentioned that this person said that he had not always been good at it but became good by working hard and long. Group 1 thus was the fixed mindset condition and group 2 the growth mindset condition. the article of group 3, the control group, said nothing about whether the person had always been good or had become good trough hard work. Afterwards, participants in group 1 showed more signs of a fixed mindset whereas participants in group 2 showed more signs of a growth mindset. 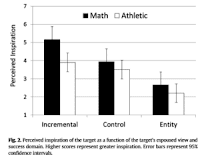 The article thus had affected their way of thinking about the malleability of abilities. In other words, the way of talking of the successful person had to some extent been contagious. Furthermore, this effect showed to be non domain specific. 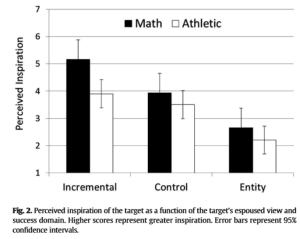 If the article described a fixed mindset or a growth mindset with respect to athletic ability this did not only influence the readers' mindset about athletic abilities but also about mathematical abilities. Also, the study showed that people who espoused a growth mindset were found to be more inspiring than people who espoused a fixed mindset. Thus, a member of the former group thus seems to be more suited to serve as a positive role model.